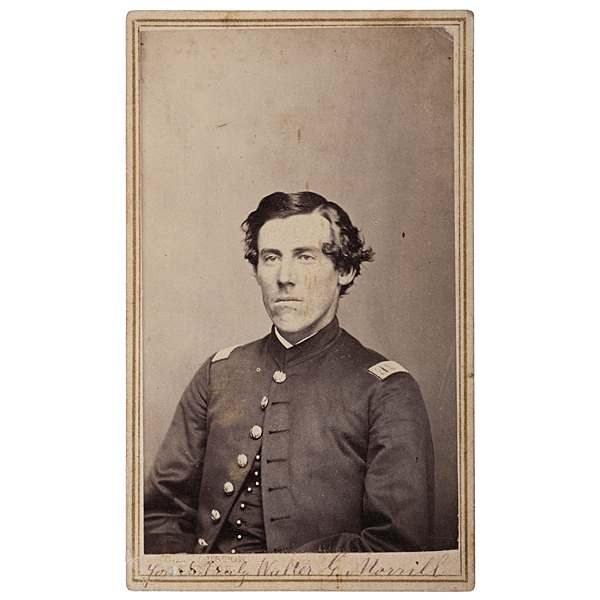 Several months later, the heroic Captain Morrill won a wartime Medal of Honor at the battle of Rappahannock Station on November 7, 1863. The valor citation read: "Learning that an assault was to be made upon the enemy’s works by other troops, this officer voluntarily joined the storming party with about 50 men of his regiment, and by his dash and gallantry rendered effective service in the assault." Still in command of Co. B, Captain Morrill was WIA at the Wilderness (5/5/64); promoted Lieut. Colonel 3/65; m/o 6/65. The 20th Maine was organized at Augusta in August 1862 and was immediately assigned to the 5th Corps serving in that organization for the duration. The regiment first saw action at Antietam and was not heavily engaged at Fredericksburg. On Little Round Top, the exploits of the tenacious 20th Maine under the much heralded Joshua Chamberlain (awarded the Congressional Medal of Honor) require no embellishment. The regiment held the extreme left flank of the Union line anchored on a promontory ideally suited for defense, a strategic position that absolutely had to remain in Union hands to ensure the survival of the rest of the army of the Potomac. During the late afternoon of July 2nd General Hood sensed an opportunity to capture the southern crest and aggressively probed the position in brigade strength finally sweeping over the slope of Big Round Top. Clusters and waves of butternuts were repelled by the men of the 20th Maine, formed in an irregular line of battle among the stone crags and boulders of the crest. As ammunition ran low and another Confederate attack seemed imminent, Chamberlain ordered his regiment to fix bayonets “and on command, the attacked became the attackers.” With a mighty yell the men of the 20th Maine hurled themselves down the sloop and through the little valley driving the bewildered Confederates and securing the flank of the Union army. The immortal defense of Little Round Top cost the regiment 130 killed and wounded out of 358 men engaged, but assured that its stalwart participants—the dead and the survivors—would forever be enshrined in the pantheon of American heroes. In 1864, the 20th Maine fought in Grant’s Overland Campaign suffering terribly at the Wilderness, Spotsylvania and at Peebles’ Farm in September. The regiment was in the thick of combat until the bitter end, suffering its last fatalities at Five Forks just days before Lee’s surrender. The 20th Maine mustered out on July 16, 1865 recording 147 killed and mortally wounded during its term of service. Condition:CDV is G+ with handling wear and rounded corners.